If you spent most of the winter in the Southeast, you know that the boulder season was unfortunately cut a bit short by an unusual amount of rain and snow...and then some more snow. Now spring is finally here, and it is rapidly getting warmer. Soon enough the humidity will start to set in, making V1 problems seem like V6, and V6 problems seem as difficult as something like that one dyno problem from the Dawn Wall. Climbers all over the Southeast will be trading their crash pads and hand warmers for ropes and harnesses, and the boulder fields will slowly start to thin out. For those, who wouldn't mind hanging on to the bouldering season just a little longer though, the highly concentrated boulder field at Rocktown is the perfect place to do so. 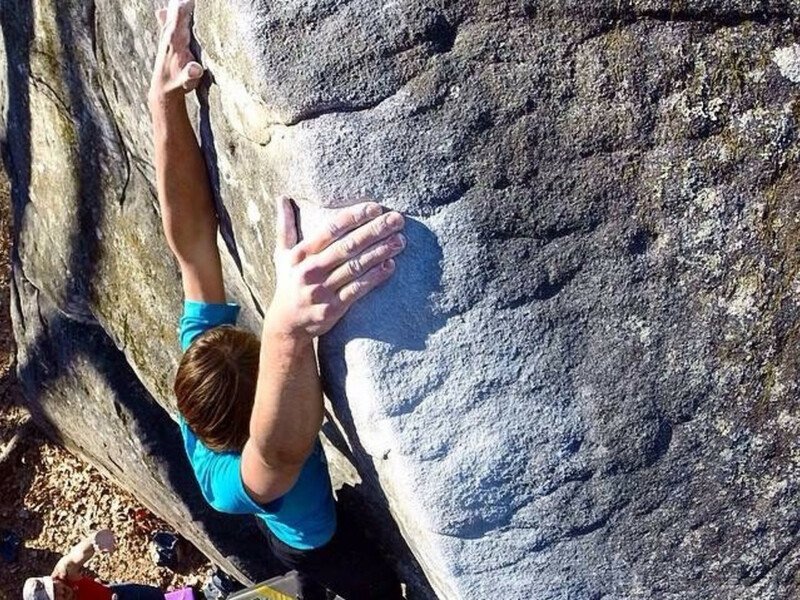 Rocktown’s convenient location on top of Pigeon Mountain, with its breezy conditions, makes it a great place for spring bouldering. Several boulders at Rocktown are still in passable friction condition, even on particularly warm and sunny spring days, and will remain so for a few weeks to come. 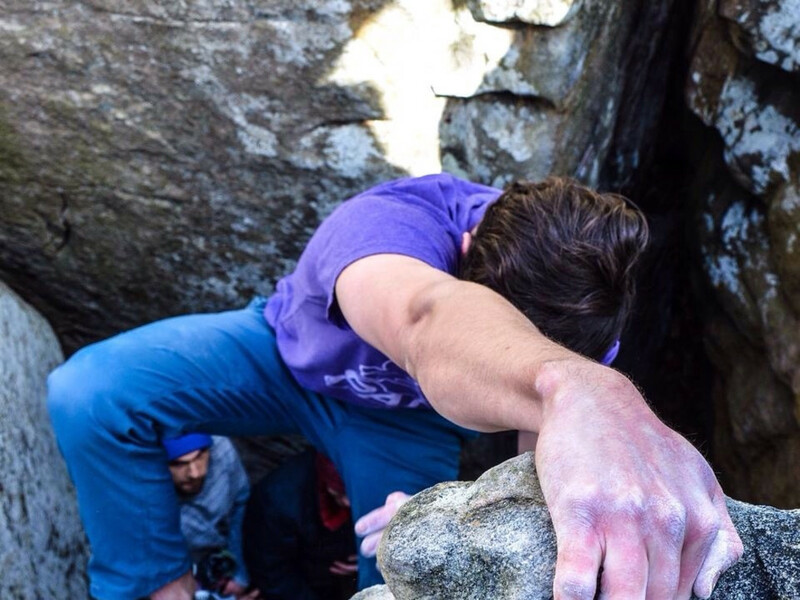 Here are a few great boulders at Rocktown worth checking out if you want to add a few digits to your final scorecard for the season. The Hueco Simulator boulders are located just past the center of the boulder field in the Upper Maze Area. 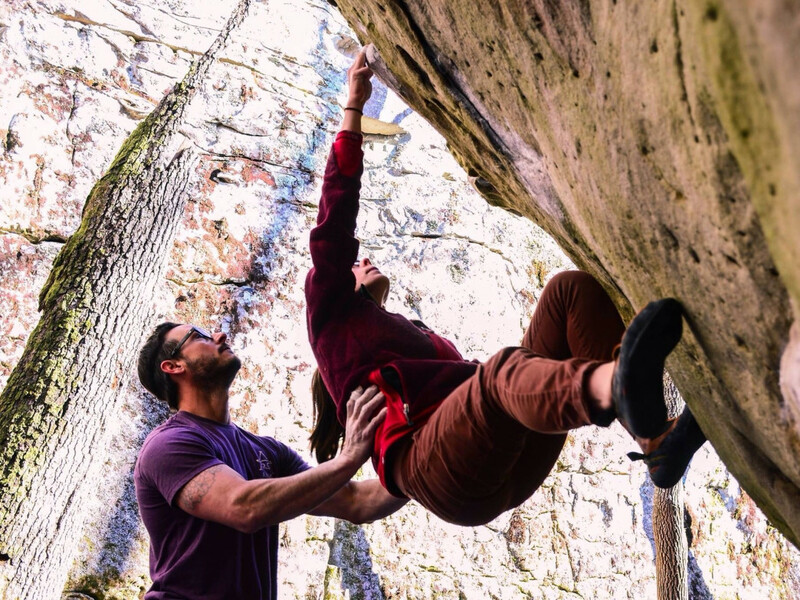 While they spend a lot of time in the sun, the problems are all easy and the holds are mostly jugs and perfect for spring climbing. The walls are huge and somewhat steep, but fun and a great warm-up area for all levels. The Crock Block is located at the very far end of the boulder field but is totally worth the hike. This block contains numerous problems in the V2 to V7 range and offers a great variety of holds. 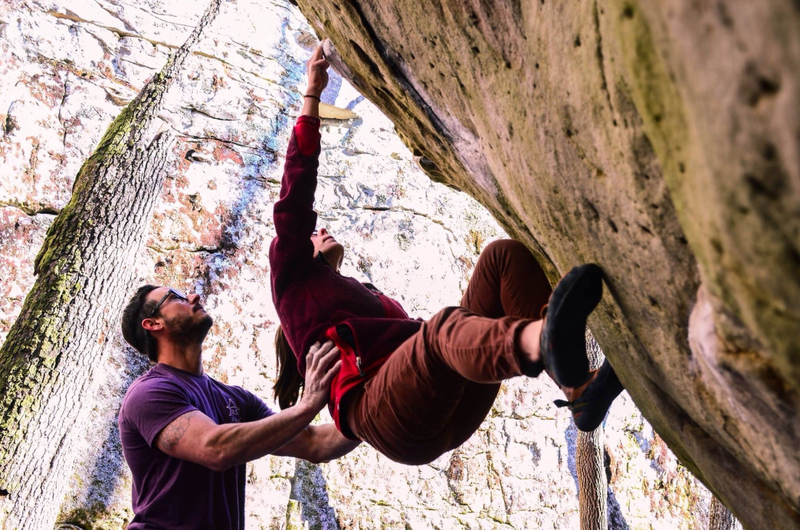 The highest star-rated problem here is a V5 called Center Crock Block. A classic highball line with quite a few slopers, so on an exceptionally warm spring day make sure you make the Crock Block a priority and make a bee-line to not just beat the temps, but the crowds. The Chex Area sits at least a 30-minute hike back into the boulder field and close to the Hueco Simulator wall. It boasts a huge amount of easy and moderate problems on fairly vertical walls. There are nine problems on these two boulders ranging from V0 to V4. The problems are varied in terrain including pockets, slopers, pinches, cracks, and jugs that make these boulders a fun project to complete. Several great problems decorate this unique boulder. Located in the Lower Maze area this boulder is vertical to slightly over-hung and always shaded. Iron rails run through the face of the boulder that tend to stay cool even on 60-degree days. Though the Comet Boulder has a fairly small face and few holds, it has several combinations of problems ranging from V1 to V8. The Standard (V3) as well as the Variation (V5) and Deviation (V6) are all high star problems that will test your crimp strength as well as pain threshold. The El Bano boulder is in the Asphalt Area of the Middle Maze and features a handful of easy to moderate problems. Everything here has at least one star attached to it, even the V0’s, making it a perfect pit stop to warm up on before wandering a few feet over to the Asphalt boulder for more moderately graded lines like Pinch Loaf (V5) and Pullin’ Tubes (V6). 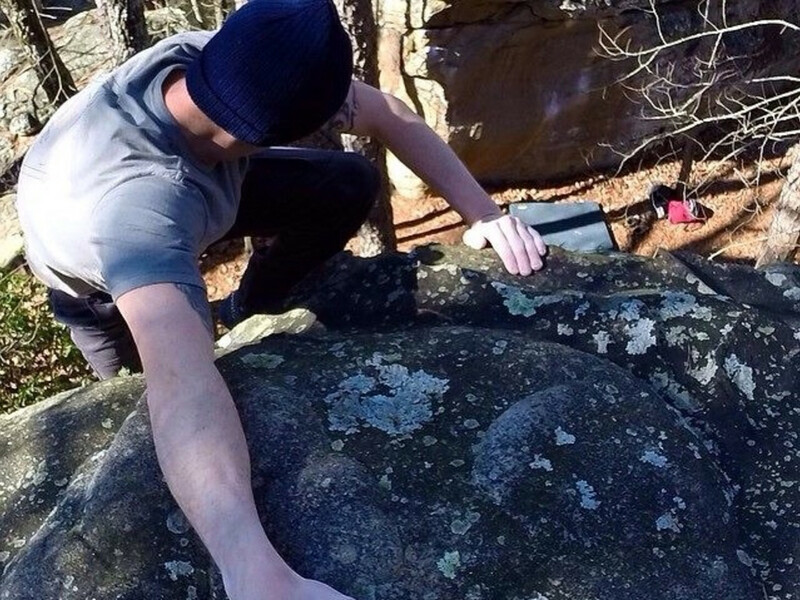 While none of these boulders will offer the peerless kind of climbing that Southeastern sandstone in winter can afford, they will at least scratch that bouldering itch for a few more weeks to come.